Onitama is the game that means nobody ever has to play chess again. It lacks the deep, enduring and maturing strategy of that venerable granddaddy of gaming but replaces it with a wheelbarrow full of fun. It’s a good trade-off. We gave it four stars in our review which is strongly suggestive that you should just go out there and get it played. That’s not always possible, and that’s where our teardowns come in. Real martial arts are perhaps not the most accessible hobby in the world but Onitama doesn’t have the additional complexity of fit, fast people trying to hit you at speed. Luckily, I am trained in mystical wisdom handed down to me by ancient monks. I can’t punch my way through a brick wall or kick someone’s spleen out of their nose but this – this is a thing I can do. Short of conditions of monochromacy or other unusual manifestations of colour deficiency, the palette isn’t likely to be an issue. That’s good, but in situations where it is an issue it’s going to be very impactful. 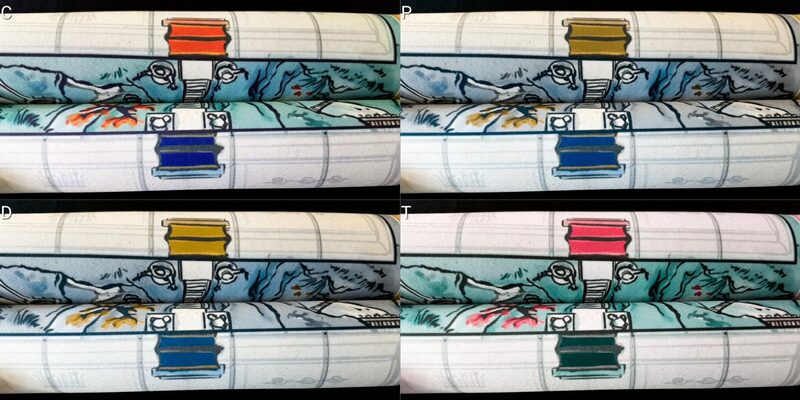 Colour is the only channel of information used to convey ownership of pieces. Statistically I can say ‘It’s almost certainly not going to cause you a problem’, but as ever it doesn’t do anyone a lot of good to be too strident about such claims. The cards make use of colour coding to indicate start player, but even in conditions where that’s going to be a problem it’s really only a contrivance – you can simply ask, or flip a coin, without game impact. Red and blue? More like black and blue. The only other component in the game is the mat – colour is used to indicate temple arch ownership, but that is also going to be a redundant game state indicator. The orientation of the board is sufficient to convey the key information. The arch nearest you is almost certainly going to be yours. The best thing about this mat is how easy it made this comparison. Overall then, we’re happy to strongly recommend Onitama in this category with a minor black mark to recognise the roughly one in 30,000 chance that you’re a board-gamer that will find the colour palette inaccessible. Even in that case we’d recommend the game – there are so few pieces that you could get by with just asking, and there’s nothing to stop you replacing the provided sculpts with alternatives. I recommend Lego Ninjago minifigs myself. The board of Onitama is five by five rather than the eight by eight of a chess board. That means that the act of visual parsing is easier because of the fewer squares that need to be considered. You’re also dealing with only ten pieces as opposed to thirty six. The down-swing in terms of accessibility is that the position of pieces is not as important to strategic play as it is in chess. Pieces mean only presence. What matters is projection of power and how you can flex the pieces you have to accomplish your goals. That means you need to take into account the whole sweep of the board – you can’t simply track what a single piece can do. The way in which your power is assessed is visually demanding. As we discussed in the review, the key thing about a piece is that it permits the projection of aggression onto a set of squares determined by the cards in your hand. That’s not too bad – it involves the assessing of two cards against five pieces. There’s no time limit or combinatorial complexity that needs to be taken into account. It’s what happens next that introduces the real problem. Most cards won’t let you directly attack an opponent – there are no bishops to sweep in from the edges, or rooks to bulldoze their way through opposition. Those pieces in chess create the ability for quick, brutal attacks that just need to be lined up to trigger and since they work at range you can often do it safely without opponent interference. Between two careful players, Onitama is a game of intricate dancing around squares until you engineer a forced error. There’s a lot of ‘if I do this, they’ll do that, and then I’ll do this’. That needs you to work out which pieces you have that can be usefully employed, assess their zone of influence according to the two cards you have, and ascertain how that is likely to impact on the zone of influence of your opponent as determined by the two cards they have. That’s one level removed from the action, and it doesn’t take you to a ‘killing blow’. For that, you need to widen the search still – you need to also consider what you can do in response to their reaction and that’s going to be based on the new card that cycles into your hand. The majority of cards in Onitama permit only a single square of movement which means you’ll almost always either be moving adjacent to an opponent or moving away from an opponent that has become adjacent. Just because you’re right by an enemy it doesn’t mean you’ll be able to hit them. To succeed in Onitama you need to assess which pieces you can force into the attack range of your follow-up action. You set them up, they move, and if all goes to plan you knock them down. Calculating your response to their likely response involves mentally swapping out the card you played for the external card, and then projecting that zone of impact on the board to see what you’re going to be able to do next. That’s cognitively expensive, which we’ll talk about in the next section. It’s also a task that requires an intimate appreciation of the spatial distribution of pieces and the grid context in which they function. It’s certainly not impossible, but it adds a considerable challenge that fundamentally alters ease of play. 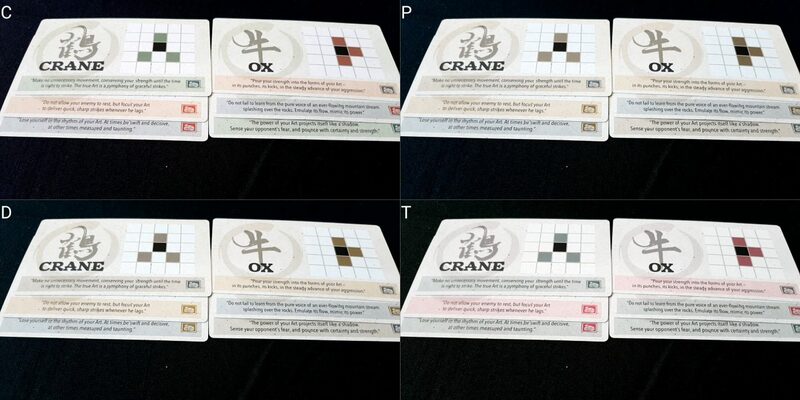 Onitama does offer tactile identification of the two different kinds of pieces, but it doesn’t permit players to identify ownership of the piece by touch. Different moulds would have permitted that easily enough but as long as there is some degree of visual discrimination and it’s possible to make out colour it likely won’t be too much of an issue. In situations of total blindness, this turns a game that might have been playable into one that is going to be nothing but frustrating as you constantly ask which piece belongs to which player. The cards themselves are pleasingly accessible – the text is high contrast against the backdrop, and the use of shaded colours with a black square to represent the piece permits quick and easy interrogation. There’s only five of them in any given game too, so there’s not a lot of card evaluation required and it’ll get easier still with practise. The flavour text along the bottom is quite small, but it’s not critical to play. Really then it all comes down to that core game loop of assessing your move, assessing your opponent’s likely response, and then assessing what you could do with a slightly different set of cards and whether or not the card you place into their possession will cause you trouble. I think it’s a very tall order, but I also think if someone really wants to play Onitama they’ll find ways to make it work. That sounds like a lot of extra effort though layered onto a game that is already a challenge. We don’t recommend Onitama in this category. A lot of the cognitive challenges associated with chess are eliminated in the design of Onitama. It doesn’t require memorising a lot of pieces or interactions between them. It doesn’t even meaningfully benefit from the building of explicit mastery of game systems. It’s a very reactive game. However, it’s still an extremely thoughtful game. I suspect even those with severe cognitive impairments would be able to handle the rules, but all that permits someone to do is to shuffle pieces around a board. There isn’t a satisfying game in here unless you’re engineering the circumstances to unleash some Enter the Dragon mayhem on your opponents. The cognitive challenge is comparable to, but distinct from, chess. In the visual accessibility section I discussed what goes into making a move. As time goes by, familiarity will permit for a more pattern-based approach than the brute-force cogitation outlined – but that’s going to take a lot of time. Until that happens, you’re stuck with building mental trees of cause and effect, reaction and reactions to reactions. The more deeply you can explore these trees, and the more accurately you can assess opponent intentions, the better you’re going to play. For most card sets, it’s difficult to get into a position to attack without risk to your own pieces. It’s difficult too to shepherd your master to the enemy temple. The challenge here is partially due to your opponent and partially due to the erratic spatiality of the board. Getting a piece from one place to another is like one of those Knights Tours in chess, except that the moves the knight can make changes every single time. It’s a very fun mechanic, but it’s extremely cognitively expensive. Coupled to that, getting a piece to where you want it to go is only part of the puzzle – by the time you move there, your opponent gets to move away. This creates a game experience that is something like trying to punch smoke – you move into a safe space in your opponent’s zone of influence only to see them leapfrog over you into a square you can’t attack. Onitama doesn’t permit a lot of chess strategies such as pins and forks (although it’s also not entirely lacking them). It needs you to think of the entire team of pawns if you want to make the most of each move you have. And you will, because games are tremendously tight both in terms of time taken and spatial restrictions. Memory is heavily taxed, but only in terms of building the cognitive model of moves and counter-moves. Unlike chess, you don’t need to construct a coherent long-term strategy and hold it in mind while you execute on it. The nature of shifting cards in Onitama means you can’t really feasibly do that. It’s not a requirement of play or even an enabler of skilful play. There are some positives here. There are moves that harmonize well, but no explicit synergies. The game state is straight-forward and what nuance it contains is positional rather than representational. The game flow is consistent and rigidly observed. Scoring is as simple as win or lose, and the win conditions are easily comprehensible. The rules for your pieces are right there in front of you, and there’s no need to for literacy or numeracy to play. However, the cost of that is that the rules are represented in a way that mandates a degree of spatial intelligence. You need to mentally locate each piece and how your movement patterns impact on a grid, and you need to then do it rotated 90 degrees for the cards your opponent has. That itself is a non-trivial task. 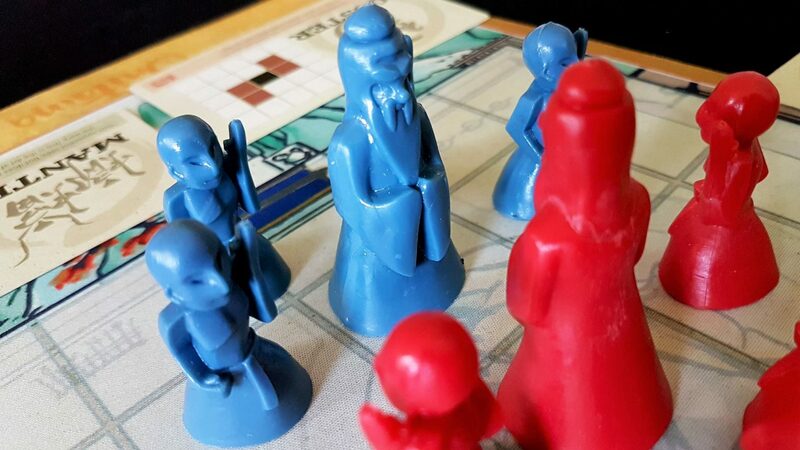 We strongly advise people avoid Onitama if fluid intelligence impairments must be taken into account, but we might very tentatively recommend it if memory alone is the problem. For that, use your judgement as to whether the need to temporarily hold spatially complex board-states in mind is going to be an issue. For impairments that heavily impact upon working memory, steer clear. For other impairments, such as medium to long term impact on memory, it might be suitable. 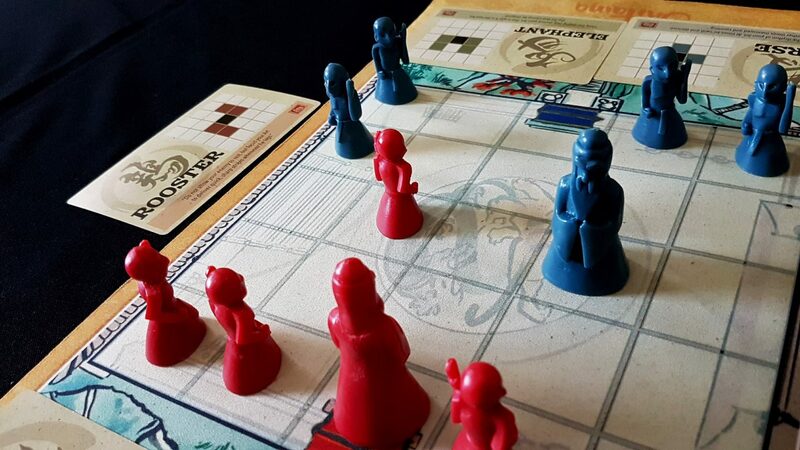 The emotional impact of a game of Onitama is very similar to that of a game of chess or Hive – it comes down to how well players handle winning and losing in a game where you are explicitly engaging in a battle of wits. As with Hive, Onitama doesn’t have the social sheen of intellectualism that chess enjoys, but it fulfills a very similar role. How well do people handle a chess loss? It’ll be pretty much the same for Onitama. Good sporting behaviour is important in every game, but especially key to games where you can’t blame loss on the cards, the dice, the stars, or the cycle of the moon. In Onitama, you’ll have access to every card your opponent did and knew what options they had available to them at the time you made your move. There’s no emotional cover. There is something too about Onitama that is meaningfully different from Hive and chess. Neither of those games offer many great ‘moments’ of play where out of nowhere you set up a win that nobody sees coming. At least that’s true when dealing with evenly matched players. Onitama though has those moments in abundance – the tension that goes along with the cycling of cards within the spatial constraints creates situations where you can absolutely pull off excitingly unexpected moves. When played well, a move in Onitama works like hitting a pinball off of a buffer – you push an opponent into a cushion of aggression that they use their move to bounce off of, only for you to pull the trigger on another move that sends them scurrying across the board. They might feel very smart to have avoided your trap until they see that all you were doing was clearing the path for your master to meander into the opposite temple. Onitama is a game that permits you to be smug if you play it well. 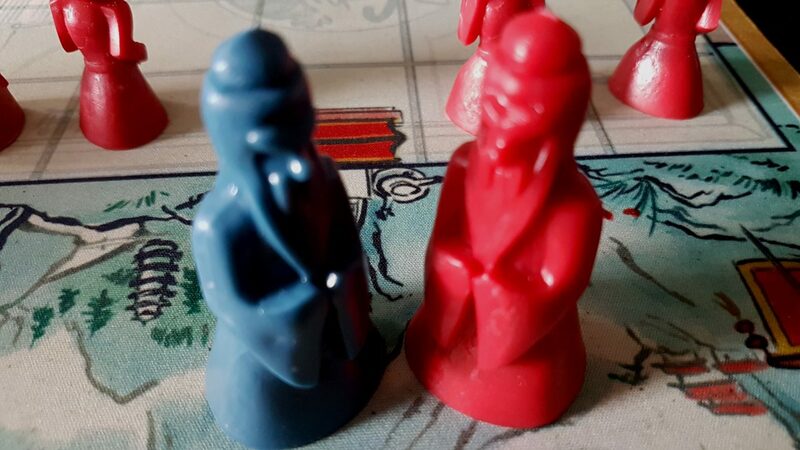 Onitama also permits players of differing ability to play together and still enjoy the experience. There’s so much variety in the game rules that nobody can meaningful master all combinations enough to go in fully prepared. However, the variation offered by the different cards is only differences in type rather than in kind. Mismatched skill levels are never going to result in the same kind of drubbing you’ll get in chess or Hive, but there is a certain positional literacy that comes with familiarity in play that will need to be taken into account. We’ll recommend Onitama in this category. There are only a few pieces that need manipulated, and the key action of the game is moving a piece on a small board and swapping out a card. The mat is nicely frictive, so it grips the table well – you’re unlikely to nudge it in such a way as to send pieces flying unless it’s by design. Small to moderate motor impairments shouldn’t impact on satisfying game play. If more severe impairments must be taken into account, we need to address some issues with verbalisation. I was disappointed to see that there were no explicit grid references on the board – even chess notation would have been excellent. The musty declarations of ‘king’s bishop to C4’ might sound horribly antiquated, but they offer an unambiguous language for describing positional intention in a very spatially complex game. Onitama doesn’t have that, although you can easily construct your own and it would be our recommendation that you do exactly that. Adopting a convention like this will greatly simplify the act of explaining movement. That’s good because otherwise it needs some awkward disambiguation. All of your pieces, save the master, are the same. Players are likely to have to resort to descriptions such as ‘Move the piece that’s at the left edge of the board so that it goes one forward and right’. Not impossible, but also not elegant. ‘Move d2 to c3’ on the other hand would be ideal if not entirely thematic. On the other hand, ‘move the piece at the celestial dragon to the raging tiger’ would be perfect and you could accomplish that with a more whimsical approach to the naming of grid intersections. A big part of assessing your play is to take into account what your opponent can do in response – they’ll be at the other end of the mat. Their cards will be face up, but if they’re too far away for a player to see clearly some kind of compensation will be required that permits both players to see the movement patterns. This might cause an issue in cases where free movement is restricted and someone can’t just lean over the table for a better look. Overall though we recommend Onitama in this category. We’d happily strengthen than to a strong recommendation if future editions make use of a formal grid notation – while it’s not difficult to construct your own, it’s also not difficult for the publisher to do it for you. The manual does not default to masculinity, and most of the flavour text in the game is inclusive. A few passages though explicitly gender the advice. Rooster says ‘Do not allow your enemy to rest, but focus your Art to deliver quick, sharp strikes whenever he lags’. Rabbit says, ‘Be near to your opponent, blinding him with your speed. The Art of the Rabbit is the Art of Speed’. With shaved heads and robes, the students can pass for whatever gender you like. The masters, with their long beards, have a more heavily expressed gender. Before writing this, I was looking up a discussion on whether the word ‘master’ in this context was fairly considered to be gender neutral. Then I remembered the beards on the sculpts and realised it didn’t matter – the game has made its choice explicit. Apropos of nothing, I wish this game had a TMNT theme. At an RRP of around £25 it’s pricier than a decent chess set. It’s roughly the same price as Hive, which is the game we’ve discussed on Meeple Like Us that most closely occupies its design niche. Unlike Hive, you’re not paying for the components – the sculpts in this box feel like cheap bath soaps. It’s a pricey game for something that only supports two players, and I doubt Onitama has the staying power of chess or Hive. It’s certainly more fun upfront than either, but as familiarity deepens with the other two they’ll become richer, more enjoyable experiences. Onitama is easier to play than chess, which will open up opportunities for trying it with new people more easily than Hive. It really depends on what you’re looking for here. Chess has the social cachet, but is a dusty relic from ancient times. Hive has the staying power, but needs a deep investment of effort before it starts to begrudgingly offer up the fun inside. Onitama will be easier to get to the table, but won’t have the staying power of either. We’ll tentatively recommend Onitama in this category. I cannot stress enough how enjoyable it is to pick up a piece, yell ‘HIIIYA’ and use it to kick over another piece. However, that is not a remotely mandatory part of play and you can fully enjoy everything Onitama has to offer while sitting in a state of meditative silence. We’ll strongly recommend Onitama in this category. There are numerous complicating factors here, but few that would change a rating from recommendation to otherwise with regards to the individual categories themselves. Still, let’s go over them for the sake of completeness. First of all, the visual parsing of this game is strongly tied to cognitive representation. We don’t recommend the game though for either category as it stands. The act of holding a mental representation of the pieces and their potential location in some future board state is difficult enough – it’s especially difficult if you can’t visually anchor it on the board itself. A combination of impairments in these categories would intensify our recommendation for both – avoid at all costs. Close inspection of cards is often necessary – they’re played face up and aren’t secret, but you absolutely need to take into account the cards an opponent has before you make your move. That’s going to be difficult if physical impairments dovetail with visual impairments. While the cards yield themselves easily to visual inspection, that’s only really useful if you can project the grid movement onto the board in front of you. And if you can actually see the cards in the first place. If communication impairments are linked to physical impairments, the strategy of explicit verbalisation will break down but it won’t be entirely undermined. The board is small enough, the pieces few enough, and the cards sparse enough that it can be played through an exhaustive iteration through all options with a player indicating simply yes or no. ‘This piece? This piece? This piece?’, then ‘This card? This card?’, then ‘Here? Here? Here?’. It won’t be elegant, but it’ll be workable and it’s a possibility here whereas it’s less feasible for many other games in the same design space. Games of Onitama are very brisk, although that’s dependent on the extent to which players are able to get up in each other’s bid’ness. It’s possible to spend minutes impotently circling around until someone finally throws a punch. Once everyone gets into the habit of play though you can dispense with a game in ten or fifteen minutes, barring accessibility considerations. While the game doesn’t support dropping out, it’s also not long enough that doing so is going to spoil an evening of play. Sessions of Onitama are made up of repeated small games rather than one long game – it doesn’t exacerbate physical or emotional discomfort. It’s also simple enough in terms of game state that you can take a break in the middle if you feel like it – take a photo of the game and you’ll be able to replicate it at a later time without any problem. Onitama, due to its highly visual game-play and cognitive cost, is a slightly less accessible game than Hive. However, it’s also (in our view) a much better game. Here we see the interesting relationship accessibility has to boardgame business practice. Our guidance here is aimed at steering people towards games they can play first and foremost. No matter how much better a game might be, it’s not worth anything if people can’t play it. We’d be more likely to recommend Hive on that basis than we would Onitama. There are a few easy future accessibility wins in here for Onitama. A formal grid system would simplify the act of verbalisation. 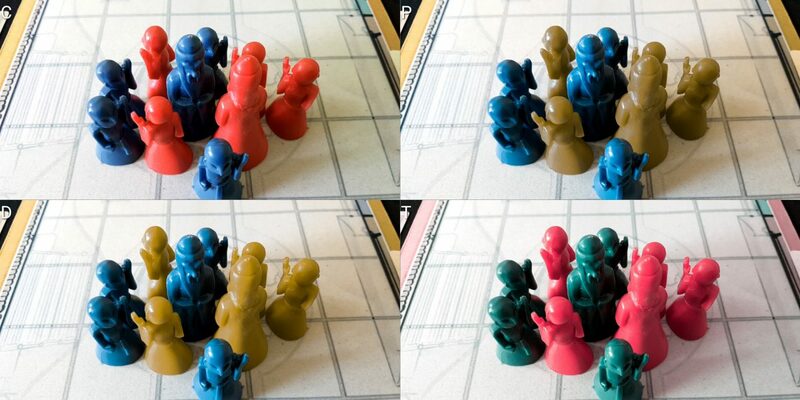 Different sculpts for each side would improve visual accessibility and even make the game playable for those with monochromacy. While it’s not possible to fix a number of other elements of the game with anything short of a fundamental redesign (which we do not advocate) it’s certainly possible for some categories to do better than they have. 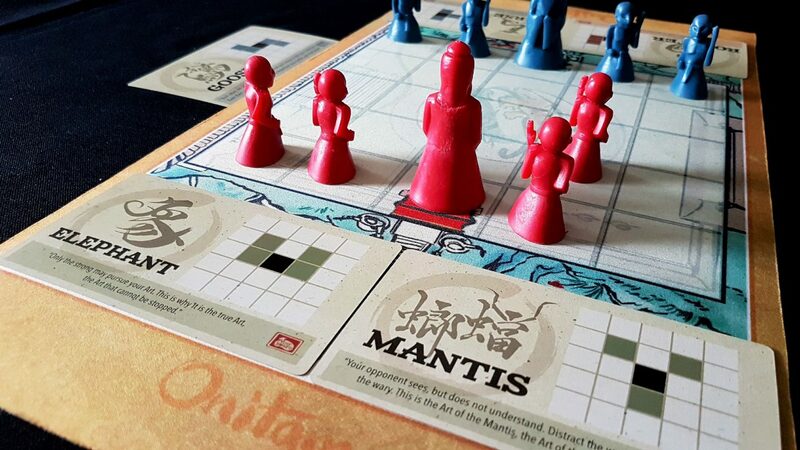 At four stars, Onitama is a game that we think merits a great deal of affection – it’s effortlessly clever, and manages to pack all the momentum and grace of martial artistry into a set of rules that fit into a tiny pamphlet. If you look at this teardown and think ‘I can probably play that’ we’d certainly advise you to give it a try.